"What an amazing trip! 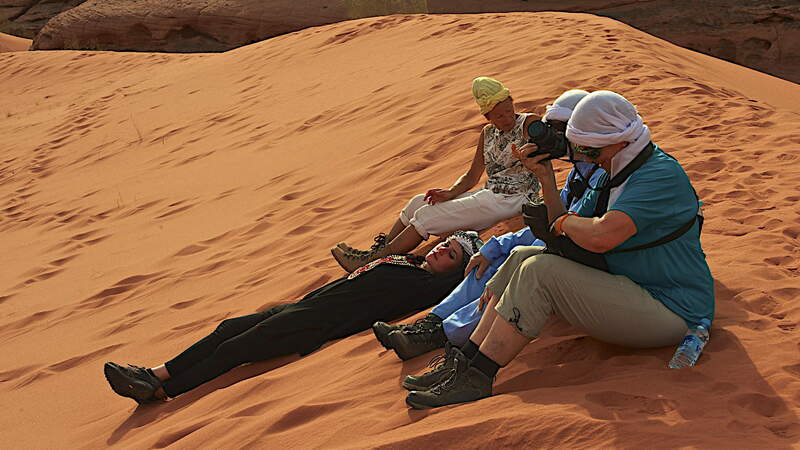 We did the one-night Wadi Rum trip and it was fantastic. Wadi Rum is absolutely stunning...there aren't really adequate words to describe it. Our guide, Khaled, was knowledgeable, patient, and funny. I trusted him completely on our hike, and he pushed me to try harder when I thought I couldn't. I cannot wait to go back. Everyone we dealt with at Terhaal was accommodating and amazing, even setting up this trip on a requested day as opposed to a day offered on the site. Thank you Huda, Abed, Khaled, and Salem for a memorable experience. We can't wait to do it again!" Salam's camp was a surprise initially, as I had been expecting to sleep completely in the wild, literally where we stopped. But on second thoughts I realised that using a small camp like Salam's was exactly the right thing to do. By ensuring that there are proper toilets, and the ability to clean crockery, not to mention a fixed Zarb, the impact of the many visitors to the Wadi and to Salam's camp in particular is minimised. Salam's camp was a surprise initially, as I had been expecting to sleep completely in the wild, literally where we stopped. But on second thoughts I realised that using a small camp like Salam's was exactly the right thing to do. By ensuring that there are proper toilets, and the ability to clean crockery, not to mention a fixed Zarb, the impact of the many visitors to the Wadi and to Salam's camp in particular is minimised. Having spent a night in the Omani desert where a particularly dunderheaded guide assured us that it would be okay just to leave the rubbish bag in a desert, it was great to see that Salam bagged up all the rubbish and put it in the big bin in the Rum village car park. I would suggest that Salam's camp is pictured on the website as a 'typical site' in which Terhaal guests might expect to stay. Accompanied with an explanation that this is the most responsible and sensible way of spending the night in the desert. Salam was particularly considerate as he made a big effort to get us out of the Wadi for us to begin the drive to Amman in time for our flight. Salam was great, with a fantastic sense of humour. Our whole group of 4 had an outstanding, brief trip. We all really appreciated the extra time and effort which Layali had gone to in order to accommodate our specific requirements, tweaking the itinerary. We made it all the way up to Amman Airport with plenty of time to spare!